Australian frog rediscovered after being “extinct” for 30 years! Some great news was reported during the past week here in Australia – the rediscovery after 30 years of the Yellow-spotted Bell Frog (Litoria castanea). 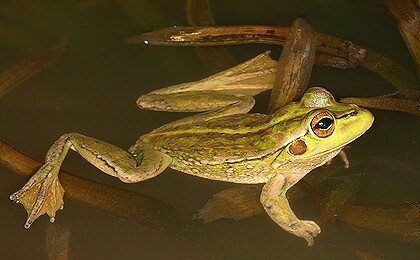 Researchers from the Department of Environment, Climate Change and Water confirmed the sighting of the species in the Southern Highlands, south of Sydney. Six tadpoles have been collected and have been taken to Taronga Zoo, where they will form the founders of what zoo staff hope will be a successful breeding program, eventuating in the release of captive-bred animals back to the wild. Taronga Zoo staff have been involved in serveal highly successful breeding programs for other amphibian species, including the Southern Corroboree Frog, Spotted Tree Frog, Booroolong Frog, and the Green and Golden Bell Frog. This discovery is really exciting news – something that is refreshing amongst the world-wide decline of amphibians. We mustn’t forget though, that amphibians around the world need our help to prevent further extinctions. When we hear great news like the discovery of ten new species of amphibians in Colombia, reported earlier this month, it’s truly a moment for hope in the struggle to prevent the largest mass extinction since the dinosaurs. The scientific director of Conservation International Colombia, Jose Vicente Rodriguez-Mahecha, told the London Telegraph: “Without a doubt, this region is a true Noah’s Ark.” One of the new species is pictured above. Yet the frog killer fungus, chytrid, is present in Colombia, but thankfully, and according to last March’s chytrid map in Nature magazine, it’s not causing mortalities there (but it does in neighboring Venezuela and Brazil). Remember that chytrid is toxic to the vast majority of amphibian species, but not all. The species in Colombia that are not susceptible to chytrid offer further hope that an antidote for mass application can be found.